In diplomacy, artful ambiguity can be a useful tool, but it can also be a dangerous trap when clarity would have been the better choice. The United States allegedly has a policy on Western Sahara, but what is it? The deal the United States made with Morocco two decades ago stipulated that Washington would not support any negotiated outcome to the issue that did not protect Morocco’s sovereignty in its Saharan provinces and would work to promote a solution that granted broad autonomy to the region under Morocco’s continued sovereignty. 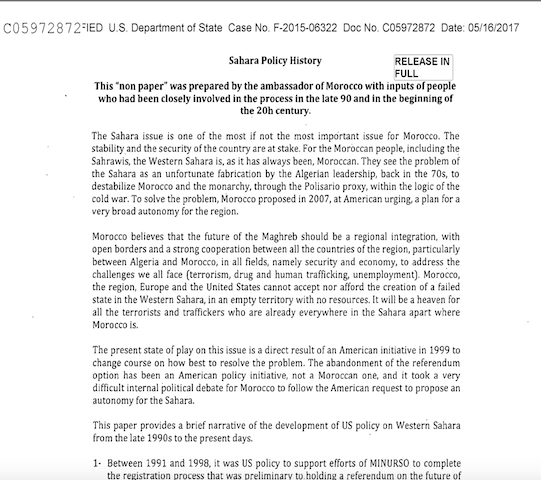 Following the declassification of a document submitted by the Moroccan Ambassador in Washington to the State Department explaining the history of that policy, my colleague Ed Gabriel and I have written several articles explaining how that policy came to be and offering our first hand knowledge of the accuracy of the Moroccan document’s contents. The deal is now a matter of public record. Ambassador Gabriel and I have confirmed the authenticity of the bargain. We were both there at the creation of the policy and participated in both the US interagency review that produced it, as well as the successful US diplomatic effort to seek the agreement of Morocco. At the outset, once that agreement was reached, I believe that the US acted in good faith to promote the policy. The first test of that came when former UN Personal Envoy James Baker tabled his proposed “Framework Agreement” in the Security Council and achieved the support of both the United States and Morocco, though the Polisario and Algeria both rejected Baker’s ideas. The second critical test of whether the policy would hold came when Baker attempted to coerce Morocco into an entirely different plan that ultimately would have denied Morocco’s sovereignty in the Sahara and violated the agreement reached between Washington and Rabat. Once again, the original agreement prevailed when President George W. Bush disavowed Baker’s second proposal in a meeting with King Mohammed VI on the margins of the UN General Assembly session in New York in September 2003. The policy passed a third milestone in 2007 when Morocco tabled its own autonomy initiative for the Sahara. The US publicly endorsed that proposal as “serious and credible.” It later added the term “realistic” to its endorsement in a speech by Secretary of State Hillary Clinton during a visit to Morocco. Following Secretary Clinton’s tenure, the policy remained a deal only in that it was never publicly nor privately disavowed by the Obama Administration, though there were no further attempts to actively promote it. Instead, the still secret commitment to Morocco progressively was replaced by a de facto policy of simply trying to maintain the status quo, a stalemate. There were no active measures taken to promote the bargain and, indeed, relations between Rabat and Washington became seriously strained when the United States began to take diplomatic steps in the Security Council that ran counter to Moroccan interests and called into question the continuing commitment of Washington to its own policy. From our own frequent consultations with senior officials at the State Department, it became clear to Ambassador Gabriel and I that it was their judgment that Western Sahara was not sufficiently important to merit the kind of diplomatic effort necessary to promote implementation of the policy, nor was there the willingness to clearly disavow the commitment to Morocco in favor of some other approach. Most senior officials at State judged the status quo as sustainable and, more importantly, preferable to taking any further risks to promote a solution that was clearly objectionable to both Algeria and the Polisario. The de facto policy, the real policy became one of doing as little damage to the status quo as possible. It is important to note here that, at the same time, there was no support inside the US Government for returning to the dead end idea of promoting any kind of referendum to settle the issue. There was universal agreement that the original reasons for abandoning that idea in 1999 remained valid. Everyone seemed to agree that a negotiated autonomy was the only reasonable outcome, but there was no agreement on the need for active diplomacy to promote that solution. So here we are today. On the eve of yet another renewal of the MINURSO mandate and after two rounds of “negotiations” among the Parties with a new UN Personal Envoy, are we any closer to knowing whether Washington is seriously committed to the policy it conceived and promoted in 1999, and are we any closer to a solution? I will not repeat here all the arguments I have made previously about the need for the Security Council to step up to the plate and table its own proposal if there is going to be a breakthrough towards a negotiated solution. Rather, I am going to suggest that the United States needs to take clear and unambiguous action to reveal its commitment to its own policy in ways that could promote the solution it seems to favor. It needs to pass this test if it wishes to persuade all the Parties that it is committed to a negotiated and realistic compromise solution. Otherwise, there is little prospect that there will be any true progress. Please note, this does not necessarily mean that the current status quo will continue to prevail as a consequence of doing nothing. There are other possible and unhappy outcomes, but I will save that topic for another day. So what does Washington need to do to pass this latest test of its commitment to its own policy? State clearly that US policy on Western Sahara is to support a negotiated solution among the Parties for a generous autonomy for the region under Moroccan sovereignty. Ambiguity on this point only encourages recalcitrance among those who favor other outcomes. Undertake the necessary bilateral and multilateral diplomatic efforts to build a solid consensus around this solution. Offer US guarantees to support implementation of such an agreement. For example, a willingness to host a donors conference to support the transition. End the policy restriction on allowing senior US officials to visit Western Sahara. The United States needs the views of its most senior officials to fully understand the facts on the ground and better promote solutions to the problems there. Commit to providing assistance to Morocco’s efforts to prepare the region for autonomy through its advanced regionalization plan. Any negotiated solution is going to require assistance with best practices for good governance in the region. This is already a pressing need. Look for ways to enhance and support the economic aspirations of the region through training and investment promotion. Clearly condemn statements made by any of the Parties that threaten a return to hostilities. Such statements are counter- productive to a negotiated solution. Silence is not the appropriate response. Insist on a census and identification project in the refugee camps in Algeria. Reintegration of this population will be difficult and having a clear idea of how many refugees will need assistance is essential to success. Press international assistance organizations to be accountable for their programs in the refugee camps. Fraud and abuse of these programs is widespread and the cause of considerable discontent among the refugee population. This list is not exhaustive, but it would be a good start. If the United States seriously favors a negotiated compromise and a realistic political solution in Western Sahara, it needs to choose clarity over ambiguity at this stage of developments.